Who’s ready for another house crashing adventure? This is a house in Roswell, Georgia that we dropped in on – and it’s a beaut. Julie, the owner, is also one of the ladies behind Milk & Honey Home, and it’s so inspiring to see how she pairs colors and patterns in her own home (while squeezing in some great budget-friendly ideas). We’re so thankful that she let us snoop around and share the pics! So without further ado… let’s barge in and make ourselves at home. The foyer just beyond the front door was spectacular. I mean, isn’t this like living in a magical jewelry box or something? I was immediately smitten. 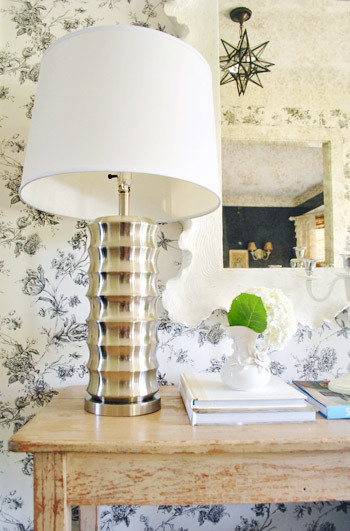 She got the scalloped mirror on sale from Ballard Designs (I’ve been obsessed with it for ages) and the wallpaper is actually from Home Depot! The ceiling light is from Pottery Barn and the lamps on the table are from HomeGoods. Oh and the table itself is a secondhand find. I’m telling you. I could have stood in the foyer all day. But wait, I forgot to introduce you to Julie. She was so friendly and easy to talk to that Clara and Burger and I found ourselves sitting on the floor of her son’s room chatting for most of the crash (while John ran around like a madman taking photos). To the left of the foyer was a dramatic sitting room with black walls and tons of pretty layered texture. The slipper chairs are from Pottery Barn Outlet and the chandelier is from West Elm. This driftwood mirror was actually a HomeGoods find! The lofted living room was a project that Julie and her husband took on after moving in. 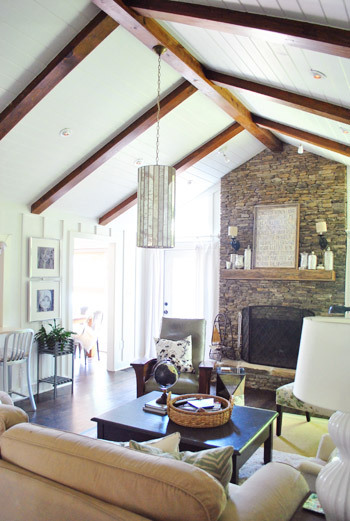 The beams were already there, but they added tongue & groove to the ceiling and used 1 x 2″s on the walls to add a “faux board and batten look” on a budget. As for that giant pendant in the middle of the room, Julie can order it for you though Milk & Honey Home. The sofa is just an old one that Julie had slipcovered since it was completely functional but didn’t match the look she was going for. Once again there was that awesome mix of modern and rustic and blingy and neutral in here. Such a pretty layered look. The pass-through to the kitchen was so much fun. Those frames with portraits of her kiddos are from Ikea and the stools are from Crate & Barrel. Here’s another shot of that awesome pass-through. I love how casually draped paper garlands and a silver deer head dress up the opening and draw your eye in towards the floating shelves beyond. More kitchen loveliness. 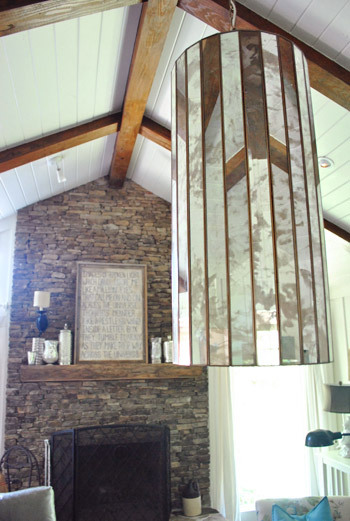 The large glass ceiling fixture is from Pottery Barn and the backsplash tile is by Walker Zanger. Julie has loved it forever and saved her pennies to make it hers (she was thankful it was a small area to tile, so it wasn’t as expensive). As for the counters, they’re actually limestone. They were amazing in person. So natural and textured. 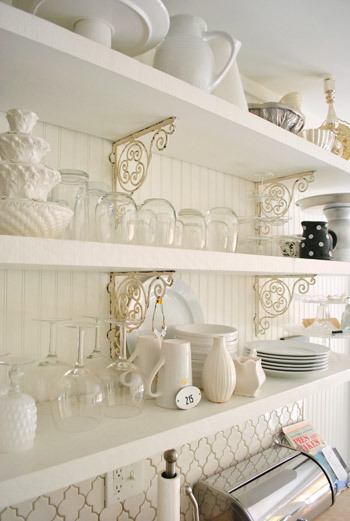 Aren’t those antique shelf brackets a nice mix with the clean and modern shaker-style cabinets and shelves? 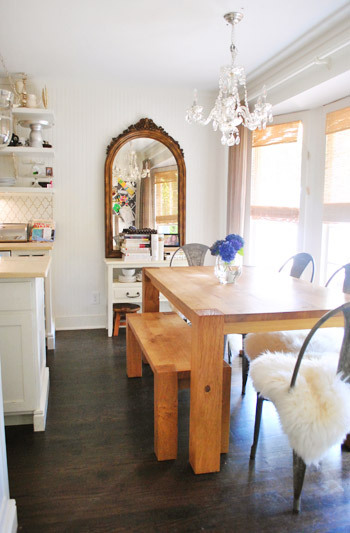 This table, bench, and chairs were from Crate & Barrel, and the chandelier over the table is from a secondhand store. Can you tell we were in love with the kitchen? Seriously, we could have put ten more photos of that room in here. This is the guest room, which all began with a red rug that Julie already owned. 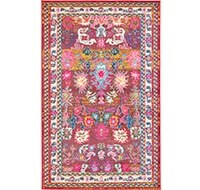 She wanted the room to feel fresh and modern while incorporating that rug, so once she saw the teal and red vase on the desk (from Anthropologie) she knew that painting the walls a soft teal color (Pratt & Lambert Pacific) would work the rug into the room in a modern and fresh way. I loved the mix! Julie’s two boys actually share a room (they love it!) 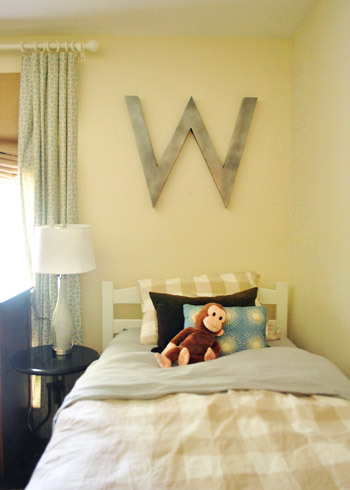 so Julie brought in two twin sized beds and hung some awesome oversized initials from Ballard Design (on clearance) over their beds. This is the room that Clara and I hung out in most – the wall opposite the bed had a cabinet full of toys- and Clara totally made herself at home. Here’s the hall bathroom, complete with basic white subway tile (from Lowe’s) and gray grout because “boys use this room!” – haha. Julie says it has held up really well to her two little men. I also loved that although this room looks totally redone, the vanity came with the house- she just painted it a soft knaki-gray-green color for a completely fresh look. Some of the little details of the house totally won my heart- like all the old door knobs that Julie has collected over time. 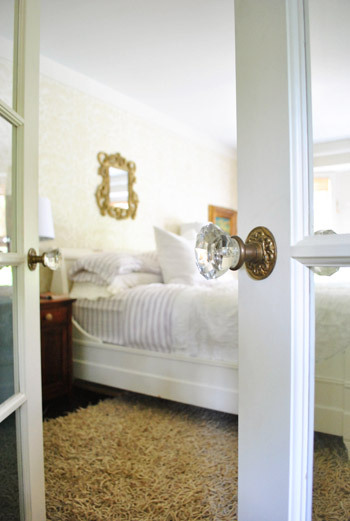 Here’s her bedroom beyond these pretty glass french doors that lead to her master bathroom. And here’s a shot looking back at those french doors to the master bath from the bedroom. I love that pop of blue on the dresser to the right of the door. The bedroom was a really soft white-on-white space, so that hit of color was awesome. Here’s the master bathroom. Isn’t that tub awesome? I totally wanted to crawl in with my clothes on and just bask in the glory of a gorgeous bathroom. Oh and the floor was white penny tile, so of course John and I oohed and aaahed. It was gorgeous. 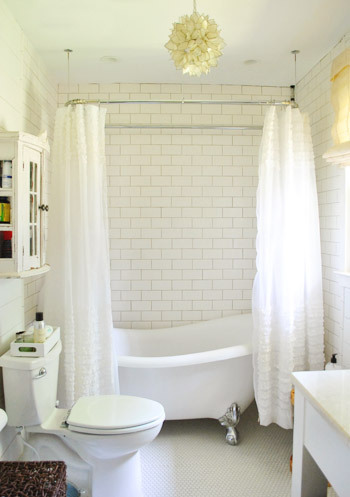 The subway tile is once again from Lowe’s and those ruffled shower curtains are actually from Target (sold as window curtains, not shower curtains, but Julie just added a shower curtain liner behind them). And that chandelier? Julie scored it for just $29 at a secondhand store called Queen Of Hearts Antiques. I really love how she mixes things, like this wood stool that she dropped into a white-on-white space for some awesome texture and a nice natural element to compliment all the bright and shiny stuff. 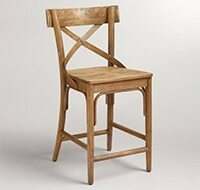 Speaking of that wood stool, it was actually something that her friend’s dad made. I love that she has some handmade stuff along with some budget friendly stuff (like the subway tile from Lowe’s and those ruffled curtains from Target). So that’s the tour of Julie’s amazing house. We’re so thankful that she let us drop by and shoot away! 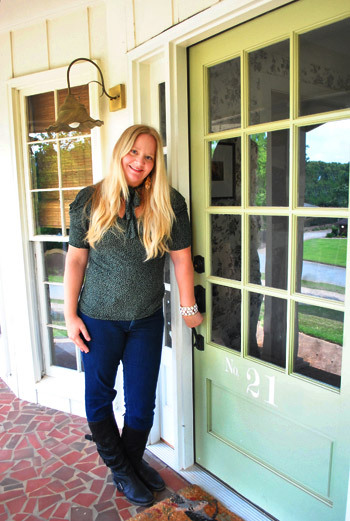 And you can read more about her and her beautiful home on her own little slice of the interweb. Now let’s play the what’s-your-favorite-part game. Anyone else gonna call that tub that I’m obsessed with? I also loved the giant rectangular capiz chandelier in the room with the black walls. And John’s calling the pass-through to the kitchen and the open shelves in there. Wow…this house is absolutely gorgeous! I want one of everything! I think that teal dresser may be my absolute fav, though. Or maybe the sitting room chandelier. This is my favorite house crash yet. GORGEOUS. I love the way she incorporates things that are natural, classic, blingy, white, floral, coloful, etc. etc. 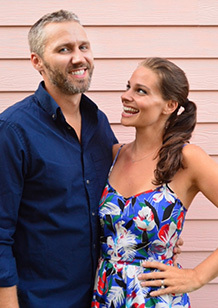 and just marries them flawlessly. 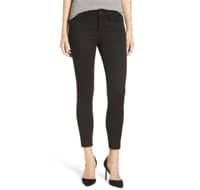 It falls very close to my own personal style in so many ways, but is just so far beyond my capabilities. Good gracious. I can’t even name my favorite part. The entry? The bathroom tub? The bright kitchen? Be still my heart! Especially w/ all her light fixtures. Love love love love love. LOVE the look of natural wood against the white walls! The pieces really stand out and become a focal point! BTW, I love your new piece by the front door! Old world charm at its finest! This home is beautiful! I love the kitchen tile & sink! Beautiful home! I love every detail and had to scroll back a few times to take it all in. I want that front door! And you are right about that foyer – I could live in there! 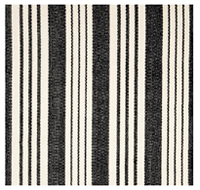 I also love the black and white buffalo check rug in the kitchen. Gorgeous! There’s so much to love!!!! I guess I’d have to say my favorite feature is the faux board and batten look in the living room. I am totally in love with this house. I love how even with darker walls it looks bright. So pretty!!! Just gorgeous! I got some good ideas for my own home from this tour. 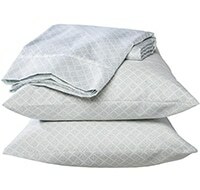 I work for Pottery Barn and I just *love* seeing how people use our products in their homes. So many different great ideas. I love the calm, inviting nature of the whole house. 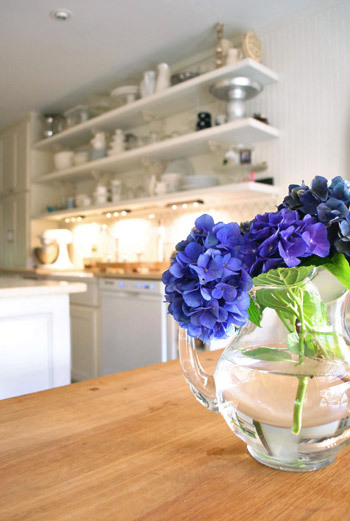 So crisp, soft and the touches of antiques and vintage make my heart go pitter patter. 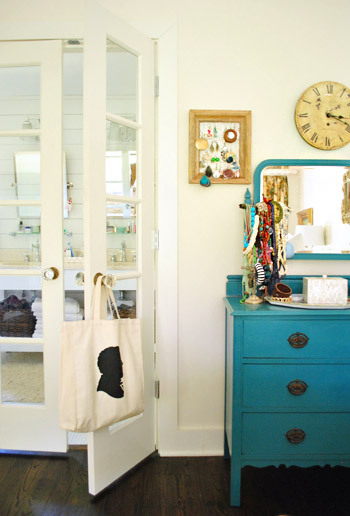 I am in love with the teal dresser that she has in her bedroom. I am now scouring craigslist for a dresser like that. Great house tour. Favorite so far. In love with that sitting room! The black walls, the hide rug, chandelier!!! Next would be the kitchen. The whole space is a mix of stuff that equals perfection! What is on the neat piece of art over the fireplace?? Love this house – just beautiful!! Wow what an amazing fresh space! You’re right, that foyer is just divine! I also looovvvee the wood table in the sitting room and the idea of initials above the kids beds is great! When we have a third child our first 2 will be sharing a room and I’ll have to steal that idea! Beautiful! 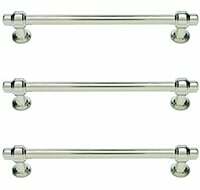 I have a question about the master bath: Is the clawfoot tub also used as a shower? I think we have the same tub and we are considering converting it to a shower by adding a shower head, but we’ve heard that clawfoot tub showers can be messy and the conversion isn’t cheap. The other option is to take it all out and put in an enclosed shower but that greatly increases the budget! Plus, clawfoot tubs are very charming so we’d hate to lose it. I believe it works as both but I’m not sure. He’re hoping Julie will drop by with more info for everyone with questions! 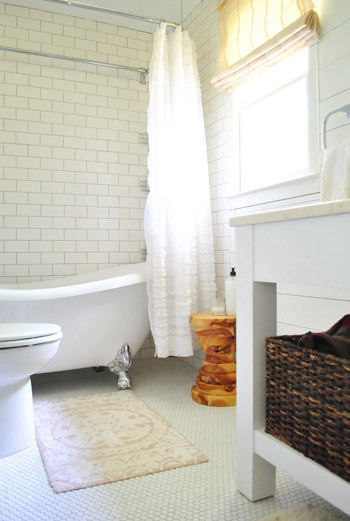 In my bathroom growing up we had an old clawfoot tub that my parents converted to a shower! My parents did it themselves (quite inexpensively) and I have no recollection of it being messy. Love the hallway and of course the clawfoot tub! Love everything about this home! It’s lovely but comfortable and lived-in looking, as well, which is sometimes a tough mix to pull off. I especially adore the kitchen. love this house. any chance you know where that white piece of furniture under the driftwood mirror is from??? Thanks! 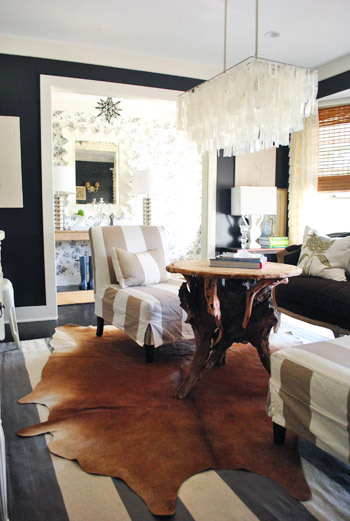 I love the big driftwood TABLE in the middle of the sitting room. Where is that from? 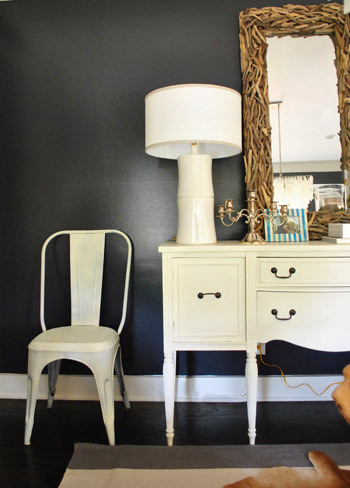 A room with black walls and Walker Zanger tile – I am in love! This house is STUNNING. I love it so much. 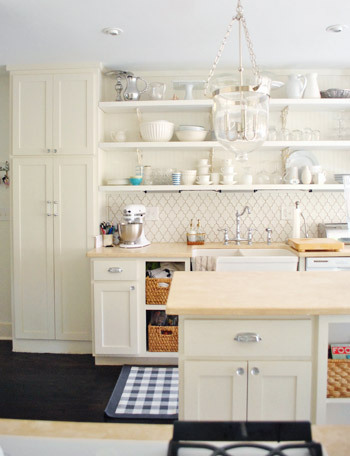 That back splash tile in the kitchen – ugh, I want it so bad. I’ve loved the shape since I saw a SHOWER done up in it. Crave, covet, lust. So super. Sooo beautiful! 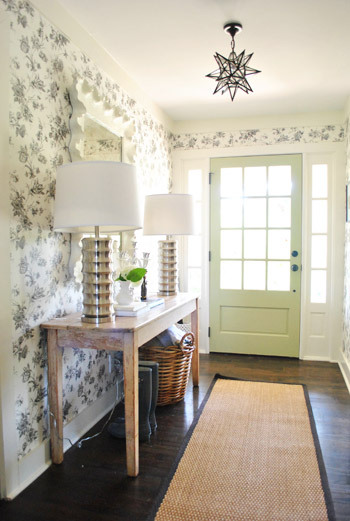 That foyer is absolutely gorgeous – thanks for sharing! My mind is blown! I think I have to save this and come back to it again and again. Thank you for sharing. Beautiful house, though I have to say I’m not a fan of antique tubs anymore. After living with one for 2 years, I can say they are NOT all they are cracked up to be! Like taking a shower in a trash bag…ugh. 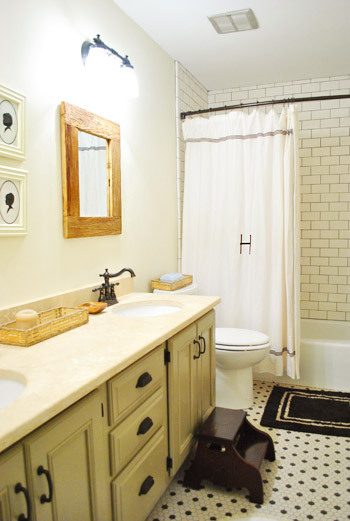 I love the tile in the bathrooms, both of them, I really love the look of the Master Bathroom! This house is gorgeous! 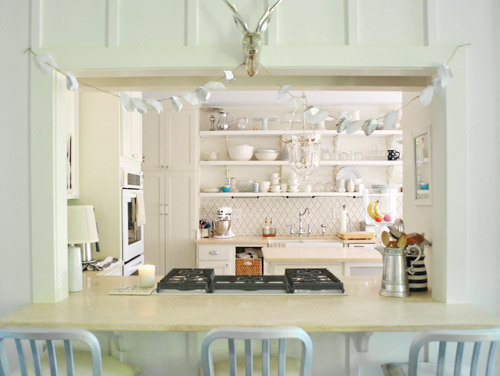 I am in LOVE with all of her light fixtures as well as the old door handles! O wow. Prob my most favorite crash yet. Do you know where she got that exterior light on her proch by chance??? It’s super cute. Thanks for sharing! Here’s hoping Julie will stop by with answers for everyone with questions soon. I’m in love with that ceiling! My fiance and I have recently been house hunting and I’d die if I found a house with this much character! I die. This is literally the prettiest house I have ever seen. I think it’s on the wall with the pass through (to the left of the opening as you face it). Wow! Wonderful decor. Thanks for sharing. Thanks for mentioning Queen of Hearts antiques in Georgia- we’re moving to that area soon and I’ll have to visit it to decorate our new home. This is BY FAR my favorite house crashing! I love the modern/rustic thing she has going on. Absolutely beautiful! I can’t say I won’t steal some of her ideas (though I doubt that I’ll execute them as brilliantly as she has!). ok I LOVE THAT HOUSE!!! Her light fixtures are all to die for! Love the whole thing! 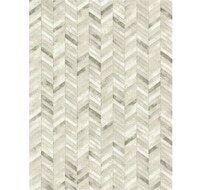 I would love to know if the grout on the walls of the master bath is also grey (like the boys bathroom). 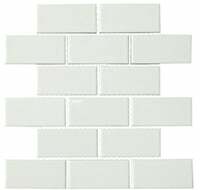 I’m using that same tile in my kitchen and I love the look of the darker grout (not white). The master bath grout looks a little lighter than the boys bathroom grout, but maybe that’s just the lighting. Thanks! I always love your posts but am always curious what the outside of the home looks like too! Is there any way you could do an exterior shot on future House Crashing posts? Thanks! We shoot what the owners allow us to share, so some don’t mind a curb shot while others prefer us to stick to inside stuff (if they don’t think the curb appeal is quite there yet since they have been focused on the inside). We did share a pic from the curb of the last house we crashed though! Since Sherry mentioned it, I thought I’d clarify that although there was a curb shot at our house, my yard hasn’t even been touched yet. My ‘grass’ is basically weeds! This is my dream home. I am bookmarking this post and her own space for inspiration going forward. It’s like she went walking around in my mind and made it all happen in her own home in ways I could never have come up with on my own! So glad she let you guys crash, and thanks for sharing! Favorite architectural elements: Those loooong windows behind Julie, and the board & batten and tongue & groove in the living room. Seriously. I die. Thing I would be most likely to run in and steal: The moravian star pendant. Or maybe Julie herself, to come and work on my home. This is such a beautiful house. Wow, im shocked! I love the openiness and the brightness throughout the whole house. Every room has it’s own feel/style and that bathtub is divine! It’s such a statement piece in the bathroom, I love it!! Where did she get it from? Possibly my favorite house crash to date. That foyer! Those kitchen tiles! Love Love Love. This is perhaps my favorite house ever! Anyone know where I could find that silver deer head? Here’s hoping Julie drops by to answer everyone’s questions soon! I am in Love with the dresser in the bedroom! Any ideas to which paint color she used? I have a dresser who wants to be painted. Love the kitchen, my favorite thing of all is the arched mirror in the dining area. LOVE.